I’ve been a little quiet recently because, amongst other things, I’ve been busily writing the prequel to Collision. I’ll write more about this soon, but it’s flowing out nicely…don’t want to jinx myself! Each Friday I go to our Writers’ group (we’re down to three with Tima Maria Lacoba and Erna at the moment, but we’re keen! and we present our latest section of manuscript. It’s such a great incentive to have a weekly deadline. 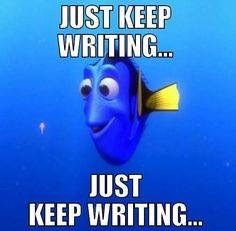 The image here shows Dory repeating, ‘Just keep writing.’ It’s that simple, or that complicated. So far, I really enjoy the writing side; the promotion and marketing of writing and publishing is much more unwieldy to juggle. But I’m chugging away, trying to improve the look and page menu of my WordPress blog http://pjbyerwritingblog.wordpress.com and learning more about all the applications and features of my new apple mac laptop, including a great program called Scrivener. 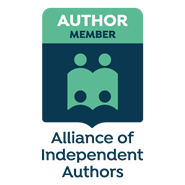 I have a guest post on October 1 on Aussie Writers on aussieownedandread.com and also have a blog tour coming up November with chicklitplus so will keep you all informed about that. 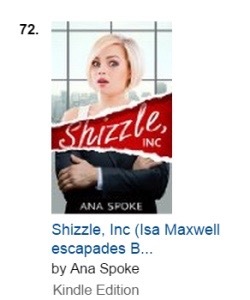 As well, I’m hosting an interview on my blog of Ana Spoke, a hip young Melbourne debut writer who has just published a funny chick lit book called Shizzle Inc.Check it out.